Time lags that prevent one of the parties from recording the transaction in the same period. Errors by either party in recording transactions. Bank errors are infrequent. The Cash Book and pass book / bank statement are prepared separately. The Businessman prepares the cash book and the pass book is prepared by the Bank (here by cash book we mean two or Three Column Cash Book). But as both the books are related to one person and same transactions are recorded in both the books so the balance of both the books should match i.e. the balance as per pass book should match to balance at bank as per cash book. But many a times these two balances do not agree then, it becomes necessary to reconcile them by preparing a statement which is called Bank Reconciliation. A Bank Reconciliation Statement may be defined as a statement showing the items of differences between the cash Book balance and the pass book balance, prepared on any day for reconciling the two balances. A transaction relating to bank has to be recorded in both the books i.e. Cash Book and Pass Book. But sometimes it happens that a bank transaction is recorded only in one book and not recorded simultaneously. This causes difference in the two balances usually arises due to timing or errors. In missing method first of all we dig out missing or error items (Find Missing or Error Items). After that find the it is missing of cash book or bank statement (Find Missing Book). Finally, analyze that it is missing of debit or credit (Find Missing Side). Cheque issued (for payments) by business but not presented for payment. A cashier may send cheques out to suppliers, some of whom may present cheque at the bank immediately while others may keep the cheque for several days. Cashier will have recorded all the payments in the cash book immediately when issue the cheques. However, the bank records will only show the cheques that have actually been presented by the suppliers. Check deposited (for receipts) but not collected by bank. The firm’s cashier records a receipt in the cash book as he or she prepares the bank paying-in slip. However, the receipt may not be recorded by the bank on the bank statement for a day or so. The bank charges some amount from each customer by way of incidental charges, collection charges or interest on overdraft etc. Bank debited the amount in pass book. But customer comes to know about it only at the end of month. When the bank allows interest to a customer, it credits the customer’s account. But customer comes to know about it only at the end of month than he would pass appropriate entry. When the bank has received a direct amount on the behalf of the business. Bank will have recorded the receipt in the business’s account at the bank but the business will be unaware. Bank may have deducted items from the customer’s account, but the customer may not be aware of the deduction until the bank statement arrives. Examples of these deductions include are standing order and direct debit payments. Cheque may be dishonored due to so many reasons. It is missing of cash book reverse impact as recorded before dishonored. >>> Understand and Practice Bank Reconciliation Statement Format. 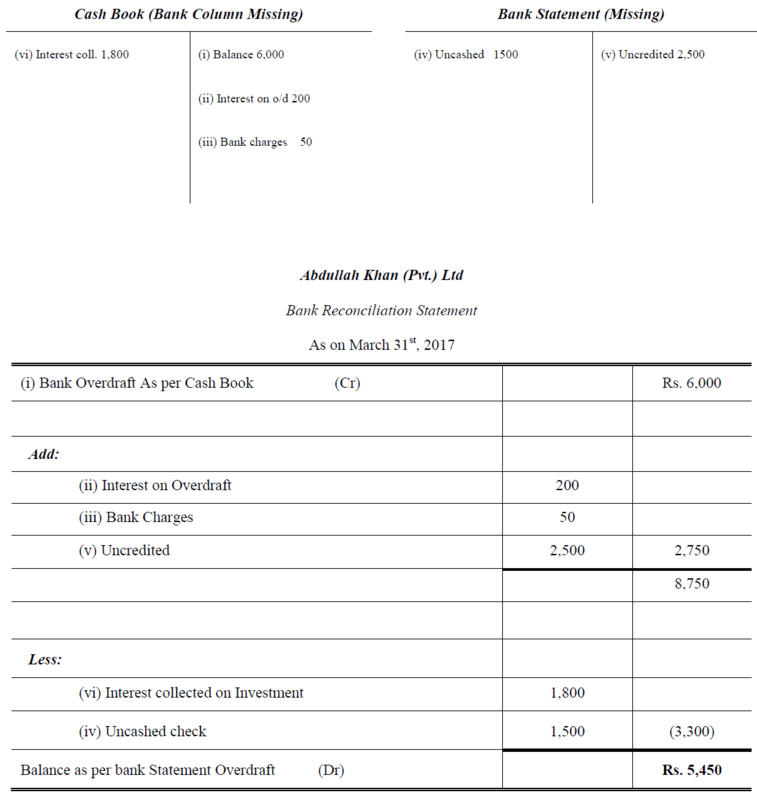 (ii) Interest on overdraft for six months ending March 31st, 2017 Rs. 200 is debited in the Bank Statement. (vi) Interest on investment collected by the bankers and credited in the Bank Statement amounted to Rs. 1,800. >>> Read and Practice Bank Reconciliation Statement Problems. 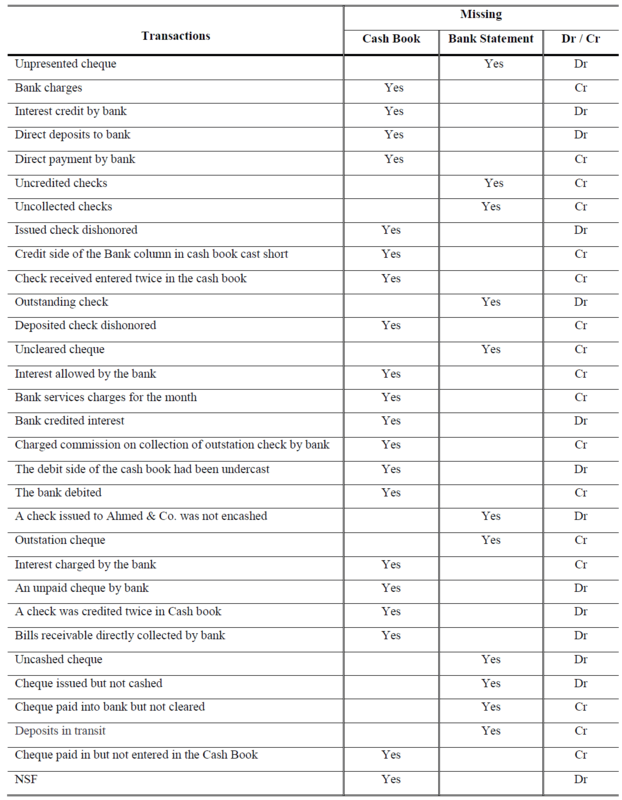 From the following transactions, you are required to mention missing (Cash Book or Bank Statement & Dr /Cr). >>> Practice Bank Reconciliation Statement Quiz 1, Quiz 2, Quiz 3 and Quiz 4. It’s truly a nice and ᥙseful piece of information. I am ɡlad that you just shared this hｅlpful informatіon with us.